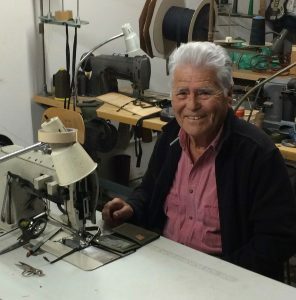 Tony has been making Hempy’s wallet’s for 20 years, right here in San Diego, California. Before Hempy’s, Tony made wallets for Rainbow, Rusty and Ocean Pacific for 10 years. When asked what was the most important factor in the quality of Hempy’s wallets, he said “straight seams, strong thread and great craftsmanship”. Tony has 9 children — 2 boys and 7 girls and 16 grandchildren. We’re proud that Tony put his kids through college making wallets for Hempy’s. Manufacturing quality goods in the United States is not an easy task in today’s global economy. However, Hempy’s values of ecological, social, community and economic sustainability lead us back to the local, to our home, and we want to stay here. We believe in building strong communities where we live, love and play. Purchasing and manufacturing goods and raw materials as close to home as possible builds strong community. It also allows us to monitor and control both the human and the environmental costs of every decision we make. We know all of our craftspeople. We know their families and this allows us to treat them like family, not just employees. We help them out in times of crisis and ensure their work environment is safe, friendly and promotes a high quality of life. Local production means less fossil fuel burned during the transportation of our products to the consumer. We take pleasure in continuing the longstanding tradition of American craftsmanship. Our products last longer because they aren’t designed to be replaced with the next fashion trend. We believe there is something special about owning a product that is intentionally made by folks who care about their craft. We are able to interact daily with the people that make our goods. We can quickly make changes or improvements to our product line. We hear feedback, oversee the whole process, and ensure that everything we make is the highest quality possible. Currently, only 2% of all clothing is made in the United States. As a result we are disconnected from the people who make our clothing, and we are unable to actually monitor their working conditions and ensure their ability to live a meaningful, dignified life. There are roughly 40 million garment workers in the world today; many of whom do not experience the same rights or protections that we believe are every human’s birthright. They are some of the lowest paid workers in the world and roughly 85% of all garment workers are women. We consistently see the exploitation of cheap labor and the violation of workers’, women’s and basic human rights in many developing countries around the world. For over twenty years Hempy’s has been making our products here in the US and helping to reverse the trend of a globalization that benefits few and hurts so many.